It's that time of the year, time to figure out what to do for Holiday Cards. When we were first married, we used to go the route of a box of cards. I generally would pick them up on December 26th and tuck them away with our Christmas decorations. It made it easy the following year, we would simply write out our cards when we decorated the house. The boxed cards worked for us, after all it was just my husband and I - what more did we need? Then a few years into our marriage, we started to add a newsletter. I think we did our first couple newsletters before we had children, just to update our family and friends with what had happened in the past year. Our cat was even included in the updates. Then, when we had kids, we decided that photo cards were the way to go. This way, the family and friends that we sent cards to could see the little ones at their best. We still include a newsletter, but now it's more about the kids. Just a few years back, my husband decided that we could take the our newsletter digital. He set it up as a second page on our website and we simply printed little business cards with the URL for our newsletter. It was sort of nice (I like paper newsletters) that with the digital version we weren't constrained by our paper in terms of the length of the newsletter - plus, we could include more pictures in the digital version (since we weren't printing them). My husband has told me more than once that he would prefer to take our Holiday Cards digital, but I'm not willing to go that route yet. 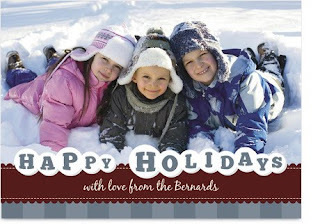 I like having a physical card at Christmas, especially a photo card. I know that I love to receive cards, pictures and newsletters in the mail and suspect that others do as well. I enjoy going through the stack of pictures and newsletters that my mom gets, when we are at her house around the holidays. I feel like going digital entirely, takes away from the experience. 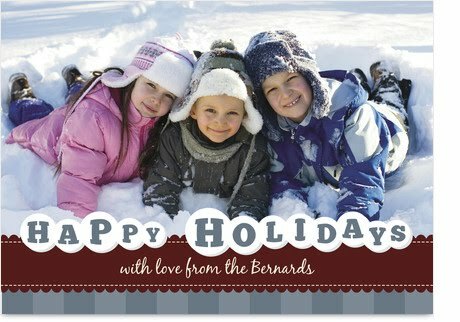 This year, I received the opportunity to give CardStore.com a try for my Holiday Cards. When I sat down to start my card, I was overwhelmed by the choices. There are so many ways to shop their site - you can shop by color, style, number of pictures and more. They have Photo Christmas Cards, Christmas Greeting Cards, Christmas Postcards, Business Christmas Cards and more to choose from. I finally settled into the Shop Christmas Cards by Type approach. I knew that I wanted a flat 5x7 card. There were so many cute choices, that I couldn't decide on just one. So, as any reasonable person would do, I opened up new tabs for all of my favorites. After narrowing it to my top 10 or 15, I uploaded two pictures, one horizontal and one vertical to use on the various cards I was considering. It was super easy to upload the pictures, and once I added them, they were available on all of my tabs! I started playing with personalizing the card, adding my pictures to the cards and seeing what I liked. This allowed me to narrow my choice - for some, the colors weren't right for the picture I had and for others, the position of the text or artwork didn't work for the picture I had. Adding the picture to the card and adjusting the zoom and position of the picture was very easy to do. Some of the cards had preset text, but on many you could change the greeting and of course, personalize the signature line. There was freedom to adjust the font style, the size of the font and the color of the font. There were limitations of course on the size, as it needed to fit in the space available for the message. I liked that it had a second small photo on the back - we added a picture of the whole family to the back. As I was checking out, I was given the option to add a return address to the envelopes (which I did! one less thing I have to do). There were other options, like adding the addresses of the recipients and stamps to the envelope and then, sending them all to you to mail or sending them directly to your recipients. I didn't select this option, but it appears that the only added cost is the cost of postage, but if you are pressed for time, this might be a great option to explore. I expect to receive my cards later this week and will let you know what I think. CardStore has kindly offered to extend to my readers a discount of 20% off their first order at CardStore.com - use the following coupon code: CSHOLIDAY20. (*for first purchase only.) This offer is good through December 31st. Shipping lead time, is listed as 2 business until they are sent to you, could be a little longer during peak periods, so there is still plenty of time to order your photo cards for this holiday - or maybe you could use them for thank you cards after the holidays. No compensation was received for this post. CardStore.com provided me with a credit so that I could experience their site and products and share my experience. All opinions expressed are my own. We used cardstore this year too, and I was so impressed with the quality! Did you see the picture gift tags? I got some & they are so cute. I also like how they partner with carbonfund.org!